A year on from the car crash that killed Gaby's twin brother and left her seriously injured and she is still trying to rebuild her life. Losing Jude was like losing a part of herself and she is struggling to come to terms with what happened. Gaby left her past behind and moved to a new area where she has gradually built a support system but she is still haunted by her grief and by the weird nightmares where she fights demons alongside a handsome stranger. The last thing she is expecting to happen on a night out with her best friend Maggie is to bump into the man from her dreams. Who is Rafa and if he's telling the truth about his history with Jude and Gaby why can't she remember him? Surely the fact that he is identical to the boy in her dreams makes his story slightly more believable but demons and angels aren't real. Or are they? As more people turn up claiming to be friends from her past Gaby is left unsure who is telling the truth and has no idea who she should trust. 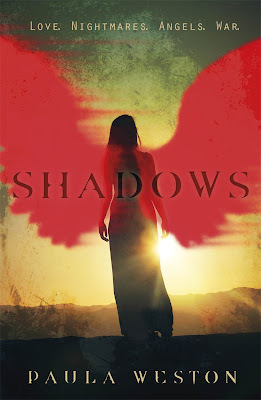 I'll admit that I was first drawn to Shadows because of the cover, I don't always have the best track record when it comes to books about angels but I just couldn't resist requesting this one and I'm so glad I did. This has to be one of the best angel books I've read and I found it practically impossible to put down once I started reading it. In spite of the fact that the book is over 400 pages long I devoured it in 2 sittings, I could have read it in one go but I ended up staying up until gone 4am as it was and just couldn't keep my eyes open any longer. Paula Weston has a beautiful and captivating writing style that pulled me into the story from practically the first page and I'm going to be eagerly waiting for the next instalment to the series. I don't want to go into too much detail about the plot because I want people to be able to enjoy the journey alongside Gaby for themselves. She is a fantastic female lead, someone who has been through so much but has remained strong and true to herself. She finds it difficult to talk about what happened with Jude but I think that is understandable and I really felt her grief right alongside her. When Rafa appears on the scene I was drawn to him immediately, he has the whole bad boy vibe going on but in spite of that he actually comes across as a genuinely good guy. He has his secrets but throughout everything that happens it is clear he cares about what happens to Gaby and he shares her grief for Jude who was his best friend. Shadows stands out in a crowded market of YA books about angels and is an impressive debut novel from Paula Weston. Her mythology is unique and I'm looking forward to learning more and seeing where she takes us next with the story. There are some great twists and things were constantly changing as more revelations came to light but I have a feeling that there are going to be a lot more surprises going forward in the series. Thankfully we only have to wait until the summer for book 2, Haze, and I have put it at the top of my wish list! If you're looking for a new urban fantasy series with great action, an unusual take on angels and demons, characters to root for and hints of a promising future romance then look no further than this book. I'm not the biggest fan of angel books either, but I'm quite curious now to read this book. I've been reading interesting things about it. @ Clover - I think you'll really like this one Michelle, it's not your average angel story that's for sure!